Chicken Soup really is Jewish Penicillin – Emily L. Pittsford….Author of "A Most Incredible Witness"
I have known for awhile. I have been putting it off sharing…only to finally submit. You see I have been ill. I have been ill with fatigue and thyroid issues for over 16 years. Though basically functional, it has been challenging. I have been to Doctors and every type out there. And yet…still ill. But never giving up hope for what God has in store for me. I have tried go eat healthy, and removing sugars and grains, and even went vegan for awhile but nothing seemed to help with a marrage of symptoms. Turning to Gods word I found there are many verses on how to eat. But I found this especially interesting. Proving that soup from bones can give people the nourishment they need. Especially when dificent. In December of last year God took me away of going to see any Dr for a time. And it’s been evident I was getting worse. It’s funny how one day you can’t do something, and the next day you know it’s the right thing to do. That can only be God! So I made a pot of bone broth. I drank a cup and my usual nightly stomach pain went away. Sleep came within minutes of my head hitting the pillow that night, and when I awoke I knew I needed more bone broth. Yes it’s a commitment. But the good news is I won’t have to stay on it forever. As it will repair my body. Some of the benefits of bone broth. Repairs the lining of the intestinal tract. Supplies our bodies with much needed minerals we are all deficient in. Can be used in protocols to help heal anything. And it just tastes like a cup of love! So as I sit here and sip on chicken soup, I am thankful God has brought me a great tool that He himself invented. It really is His penicillin! 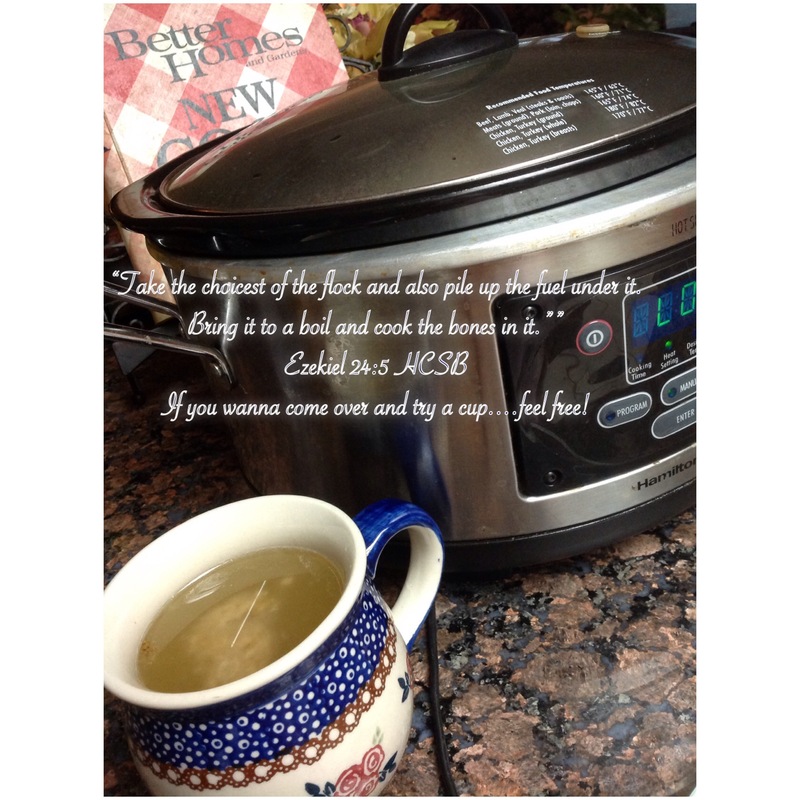 One cup of chicken…or beef…or lamb, or duck…soup at a time! Previous Post What I learned about Mother’s Day after losing our son. It’s like anything…start slow. It’s available at a lot of health food stores in the freezer section. (I buy bonefied as it’s locally made, and I follow them on Instagram ;)). That way you can try it and see what you think. Monetarily it is better to make it. At Whole Foods their organic turkey or chicken necks and backs are only $1.99 a lb! And I like to use the meat off the bones (turkey and beef only, chicken there’s not enough to mess with) for my dogs, so it’s a win-win for me. Great! Thank you! Do you have any favorite recipes? I found Bonafide on Instagram, so I can start learning. I have my family on board… so that’s good! Will try this next week… will let you know how it goes! Do you usually make a large batch and freeze extra? Again, thanks for the info! I am excited for you! Koodos to your family! Go for organic. You can do raw or cooked. I would only suggest “clean animal” bones. Meaning no pork etc. I do mostly poultry and beef. But I’ve done lamb and duck. But fatty meats I put in the fridge for a day so I can skim off the fat as I can’t handle it too well. (Just beef and duck). Soak in non-tap water for 30 minuets with a dollop of apple cider vinegar. It helps to draw out the minerals. I use a crock pot as it’s easier.You want a bare simmer, so I set it on low. You can put it on high at first as raw meat shouldn’t be in too long in lukewarm water. (Just watch it so it doesn’t boil hard). My SIL (a retired food service employee) would suggest to get the water hot first, on the stove for raw bones. But so far I’ve been ok.
You will start looking at the leftover bones from a meal with a new zeal that they too can be used! I just ate four chicken wings and the bones are now in my mini crock pot..:) And being I had seasoned them the broth will be amazing! If you’re having sever gut issues they say just 2.5 hours for stock at first, there’s a reason I just can’t remember. But I go up to three days with most bones. It just comes out richer. You can add any vegetables I suppose. I’ll throw in onions, celery, or herbs. You get to choose. Potatoes are great for the minerals, but throw them away if you’re trying to cut out sugars. I am continually making some. Being it lasts up to a week fridgerated I rarely need to freeze any. But it’s up to you. I didn’t think it froze great when I did freeze it. But for travel I go ahead and do it and let it act like ice pack for any other food I am bringing with me. Oh…another tip. When you pour out the broth to heat up on the stove, there’s some good stuff left on the sides and bottom of the jar. So when it’s warm to hot I pour some back in the mason jar, put the lid on and swirl it around gently. This will melt the good stuff and you’ll thank me later…;). This will also help when you wash it as no one wants to put fat down the kitchen sink. Thanks for all the questions. Maybe I should do another post on all I’ve learned since then! Ooh, thanks for the tips! I’m interested in making actual soup meals with bone broth. So this will be fun! I don’t think we have a whole foods near by… so I will check out my local Sprouts. You gave me a good amount of info to get started but love another post! I’ve already re-read your answer a couple times just to envision the process. Awesome! I’ll love yo see what you come up with 😄!